I cannot tell you how excited I am for today’s post. Because it’s been “brewing”, ok, “seeping” since April this year. When my honey and I take our annual trip to the mountains, we like to walk around and look in the shops. Most of the time, we buy nothing. Or very little. But I saw something that triggered my blogging mind and put it on the back burner to simmer. OH boy! Can we use any more cliches in one paragraph?! 1. Supplies needed: loose leaf tea (whatever flavors you’d like), jr. size coffee filters, string, free printable tags in link listed below. Prepare tags by printing, cutting apart, and folding over the top portion to leave enough room to paperhole punch. Punch one hole in each tag. 2. 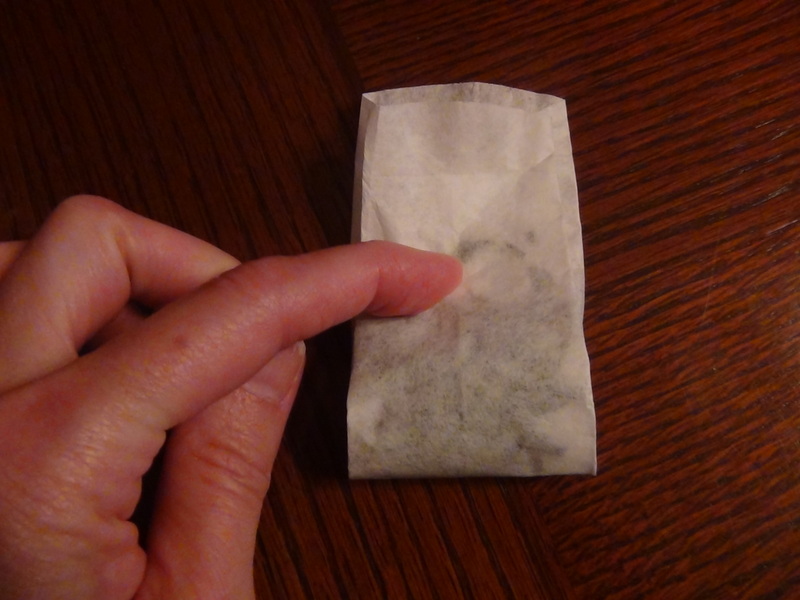 If you want to make your own tea bags, it’s pretty simple! 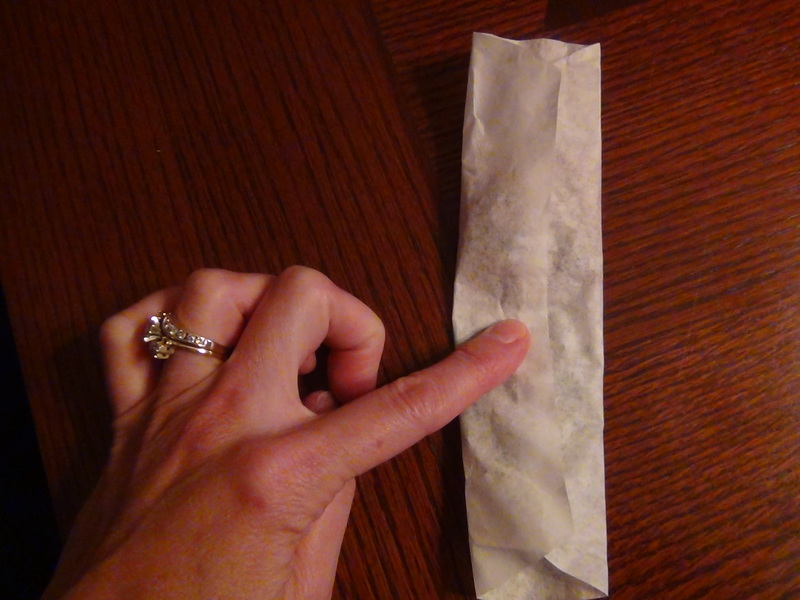 First, cut your coffee filter into a rectangle. Ok, well, close to a rectangle. Place one flavor of tea on each side according to tea directions. Yeah, those are usually good to follow. 4. 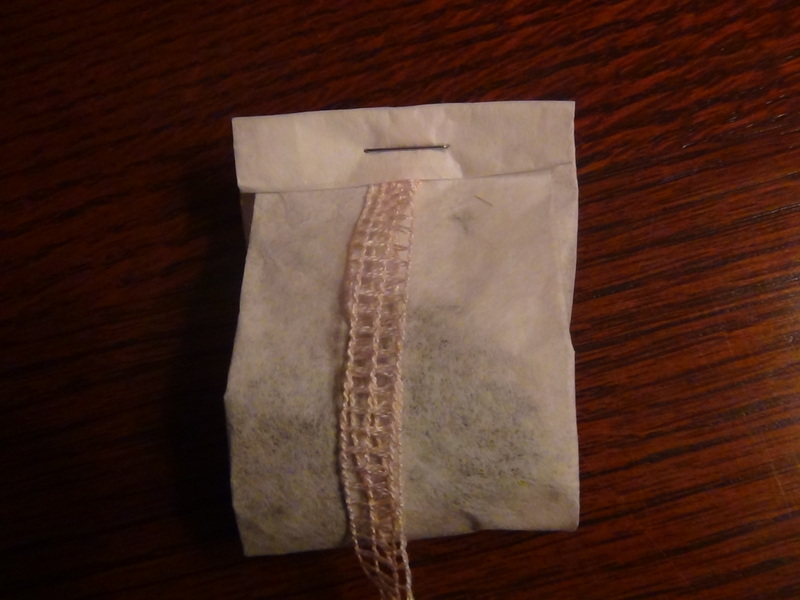 Once folded, slip your prepared string through the Scripture tag, then secure both ends of the string into the tea bag fold. One staple then holds all the layers together. 5. And there you have it! Your own tea bag. 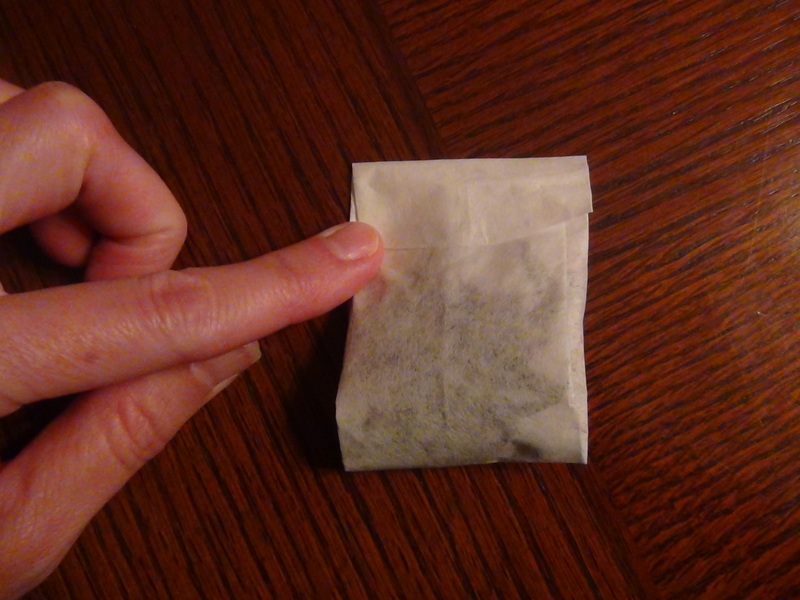 You don’t HAVE to make your own tea bags. 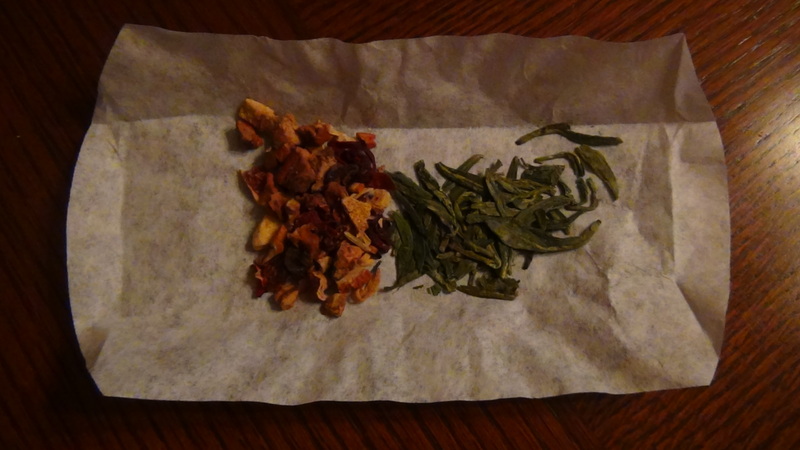 If you like loose leaf tea, yes, I know they make tea balls. And also disposable tea bags you can fill… but, you can make a very beautiful gift for a tea lover or someone you know who could use a little “Be still and know that I am God” time. I think that’s all of us! If you’re not crazy about the idea of making your own tea bags, you could still buy a box of tea and focus on adding the verse tags, just staple them on over the current tea tags. Or remove the old one and replace with the Scripture tag. 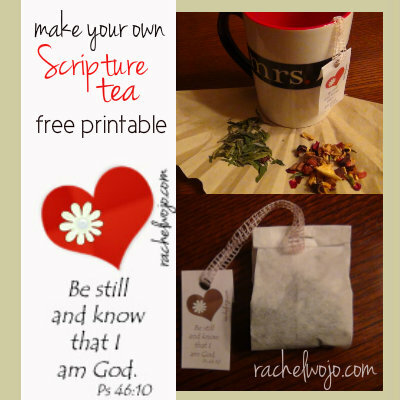 To add more thought to a gift, you could also create the Scripture tags with verses specifically chosen for the loved one or friend to whom you’re giving the gift tea set. I have two color choices for the Scripture tea gift tags today. To download the .pdf free printable for the Scripture tags, click here for brown or here for red. Or you can also click on the graphics below. Because I so strongly believe in meditating on God’s Word, I am hoping that you enjoy this post to the fullest and experience some beautiful quiet time with the Lord as a result. Before you go, be sure to enter the giveaway and let all your friends know! The giveaway is open through Labor Day and the winner will be posted on Tues., Sept. 3rd. Follow the rafflecopter instructions and I’ll see you tomorrow! Post contains affiliate links; site may be compensated if purchase is made. All opinions expressed are my own. Full disclosure policy here. 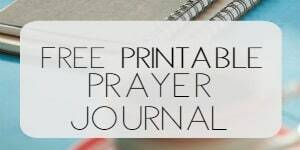 This is a wonderful gift idea.Thank you Rachel for sharing this idea with us.Blessings. What a great way to bless someone! Especially with specific scriptures based on the occassion. I love those mugs! I was thinking more about the occasions…. you could use the idea for ladies’ tea ministry events. Or this would be an easy take-home gift to give at ladies’ events. I read this post because I’ve had scripture tea before and found it uplifting. I think this is a great idea…to make your own! You picked a great verse for the tags too! I love this idea!! We exchange homemade gifts for Christmas. I am going to make these for my mom and sisters. Thank you for this post. This is great! I love the fact that you’re providing a printable for us, too. Thanks! I stopped to read this post because I try to read most everything you post. Rarely do you have something that I’ll just skim over. I look forward each day to seeing what you have written and how God can direct it to my heart. I enjoy tea and always like easy gift ideas! I love this idea, never thought of it! Can’t wait to make some scripture tea! This is a great idea! I think it would be a great teacher gift! I am looking forward to an afternoon of scripture tea myself. Such a great idea!! I cant wait to have my first scripture tea! This is a great idea “just because”. However, you have also sparked a tremendous idea for Christmas gifts and I’ve just marked 4 off my list! Thank you!!!! typo: What intrigued me *was the TEA! This is a wonderful idea I’m definitely going to try for Christmas. Although I may have to tweak it a bit for non-tea drinkers. Love this and I love the Mr./Mrs. 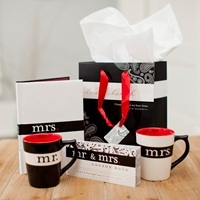 DaySpring mug set–just gave a set to my niece as a wedding gift. Fun! Fun! LOVE this idea!! My mother-in-law is a tea drinker, so this would be a nice gift idea for her 🙂 I’m gonna have to go get crafty! Thanks for this! I’m so excited that you introduced me to the scripture. What a lovely idea. This would make wonderful gifts for tea and coffee drinkers alike. I will have to do this! I drink a cup of tea every morning while I am reading my devotions for the day. I look forward to making these for friends as a pick me up during the day. I have tea with my quiet time every morning and will be making some Scripture Tea bags for gifts! Thank You! I love tea! 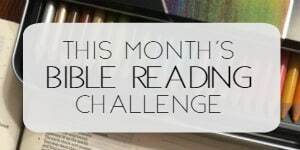 Thanks for the great idea, Rachel, to sit and savor God’s word! My husband and I love to enjoy tea together and Scripture tea sounded intriguing. Think I’ll make a batch of these with different verses to tuck in his Christmas stocking. Thanks for the idea! I love this idea. What’s better than to sit with the Lord while sipping a cup of tea? What a great idea!! I love the printable. Thanks! I love your website!! This is my first trip to it. I’m curious about the size of the rectangle to put the loose tea leaves in. Sometimes pictures are a little hard to judge sizes. Thanks and God Bless!! When I cut off the sides, the width of the filter is 4 and 3/4 in. 🙂 I folded the circular filter in half and just cut off one edge so that’s how I arrived at that width. Make sense? Absolutely!! Thank you very much!!! You had me at make your own tea bag!! As a tea lover, I am so excited to try this and make these as gifts for friends and family. I love homemade gifts and was interested to see how you made the scripture tea. Wonderful idea! I needed a birthday idea for a tea-loving friend, and this is perfect! I cannot wait to try them out!! What caught my eye was combining crafting and God’s Word-love it & blessing others is the icing on top 🙂 thanks for the giveaway!! LOVE, LOVE, LOVE this idea! I’ve got some college girls that I know would enjoy this! Thank you!!! This is a really neat little way to incorporate being still into your day — love it! Wow! I never thought of making my own tea bags. What a great gift! This is so cute and crafty! I would lovvvvvve to have it! I love reading all your blog posts & this one is no different! 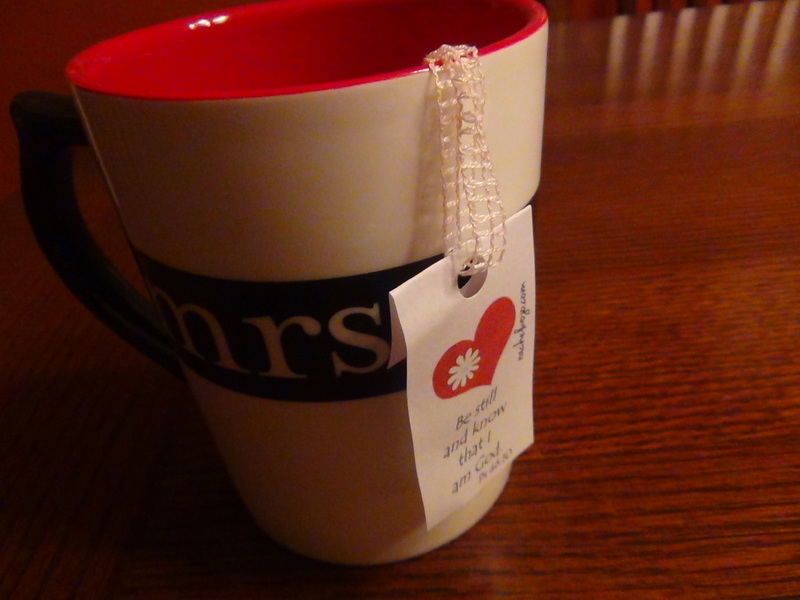 It is such a wonderful idea to add a scripture tag to tea…. A perfect start to the day- Tea & still time with God! I enjoy making homemade gifts, so I wanted to see how! This is a great idea! Thanks for posting! I really love this idea!! I love tea and coffee! I have had scripture yea before as a gift and I loved it! I will def be making these as a gift and for myself! 🙂 I also love that mug set! My friend has the set and I always loved it! Thanks for sharing! I love tea and scripture. So seeing the title about making your own scripture tea bags intrigued me. Also I love your blog. Thanks for the great idea and this giveaway. God bless you. I ♥ tea. What a wonderful way to bless a friend! New to your blog, but Love, Love, Love what I am reading. And I love this idea. Thanks so much! God is gracious, Nikki! Thank you! The fact that there was a scripture and d.i.y element. I was prompted to come to this blog by the title of the post – I’ve made cloth teabags before and the idea of making scripture tea was too great to pass up! So excited about this post, we are hosting a tea as a fundraiser for our ministry, and this would be a great give-a-way!!! I am making these for that! 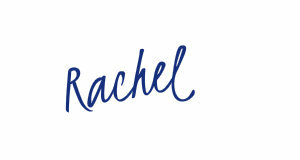 I really love this idea, Rachel! I’m throwing a “tea party” birthday party for my daughter next week, and would be a fun gift for the moms! I must say that this gift idea is intriguing and I am now inspired to design some tags of my own! GREAT idea! I work in a Christian school as the librarian and am always looking for inexpensive ways to bless the faculty and staff at Christmas. You solved my problem for another yr! My friends and I are always looking for new ideas to make for various occasions, so when I saw make your own scripture tea I had to read this. Thank you for the great how to!! I love this…I love my tea time everyday and ps 46:10 is one of my favorite!!! What a great encouragement and idea you have shared. Thank you!! That’s such a cool idea! Thanks for posting it! What a great post! My husband is about to start his new job as a police officer so our time together in the beginning will be limited. This would be such an amazing idea for us to do together whether early morning, afternoon, or late at night. I love this idea of making scripture tea. I love the idea of encouraging people around you with the Word of God. I loved the craftiness and such a unique gift!! I was drawn to reading this post because scripture & tea are 2 of my favorite things!! I also had never heard of scripture tea bags before & thought it sounded interesting! Just found your blog… love it! Looking forward to finding out who wins the give away. Best of luck to everyone! 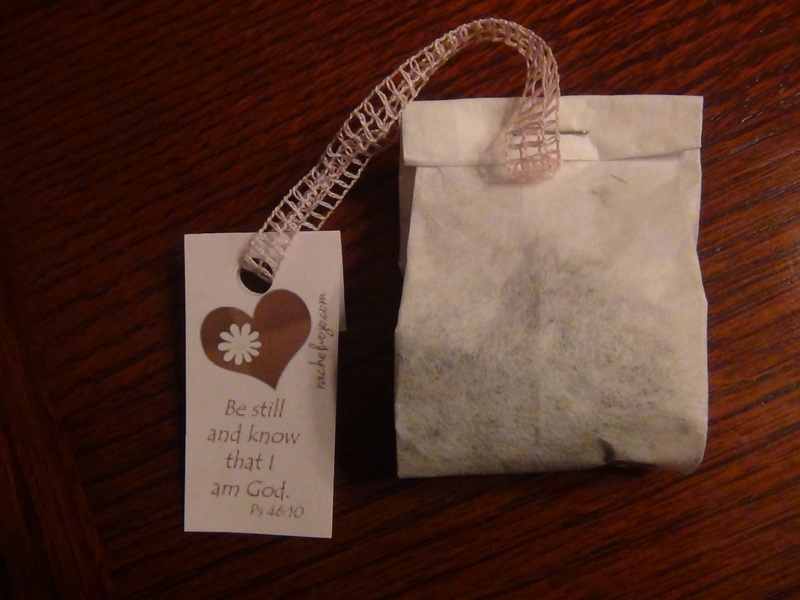 Love the scripture tea bags for a gift. Thank you for the idea and the printable! You rock! How fun and how uplifting it will be for the recipient. I will be thinking of ways to also spread the joy to my coffee drinking friends! I am going to make these for encouraging gifts. What a great post/ idea!! I LOVE giveaways! My sister is getting married and this would be such a cute gift! She loves tea ( I am more of a coffee lover ) but the idea of stealing time to spend with God is so important for everyone especially newlyweds who can sometimes think that their new spouse can fix everything wrong with their life! I know I went through that wrong thinking myself. 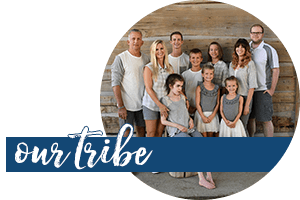 I love this blog and have grown so much through all of the resources provided. Hope to win this awesome giveaway! What a cute gift idea & fabulous giveaway Rachel!! Thank you! I would love to give a meaningful gift like this – wow – it is so impressive. Tea and scripture! Thank You for showing us how to do it! We already have a set of the mugs I purchased one year for our anniversary, but I would love to be able to give a set as a gift to someone else! I love tea and I have been eyeing those mugs and that set on Dayspring for probably a couple of years now. It is so cute but I haven’t been able to bring myself to actually buy it. I would be so ecstatic if I won it! 🙂 Thanks for doing this. Oh and those tea bags are super cute too. cant wait to make & give to my friends!!!! What intrigued me about this blog post? Well, I found it through the vintage home making week at Karen Ehman’s . I have been quite pondering much of the quiet, simple lifestyle of our grandmother’s lately. The whole idea of being still is also something I am working on getting better at. Not to mention I am a trying to get in the habit of drinking more tea. So evrything about this post is right on with my musings these days! Thanks!! This is such a creative idea. I love sitting down with a cup of tea and scripture. Thank you for sharing. Thank you for sharing. I am always looking for a personalized gift and this is a great one. I love reading you posts. The homemade part! I’m looking for ways to do more homemade crafts and things for special occasions! Cheaper and adds a personal touch! This is a wonderful idea for a gift. Thank you for sharing! That’s such a cute set, and what a great idea that Scripture Tea is. Being a mom I love this idea! I actually followed a pin here for the purpose of learning how to make my own scripture tea then I realized there was also a giveaway but it was the how to make the scripture tea that brought me here, originally. Making your own tea bags!! Great idea! Love this idea Rachel! I’m thinking I may have to do work on this for Christmas gifts gifts for my kids teachers. WOW, great way to start your morning tea. I love those mugs unemployment ran out can’t afford it now. Wonderful post! How encouraging these tea bags can be to a fellow sister in Christ that is down or someone looking for the gospel. Love the idea to stop and have a cup of tea and have a scripture to meditate on. Thanks! Also, great gift idea to encourage someone. I love this idea! I wish I drank more tea and less coffee. Such cute mugs! Love to read scriptures! so many times I will check Facebook or pinterest during my morning coffee/tea but what a great reminder to stop and thank God for the day. Especially while its quiet before the kids wake up! I really find your whole blog so uplifting, thank you! Wow, what a great idea! Definitely gong to make some for my MIL!